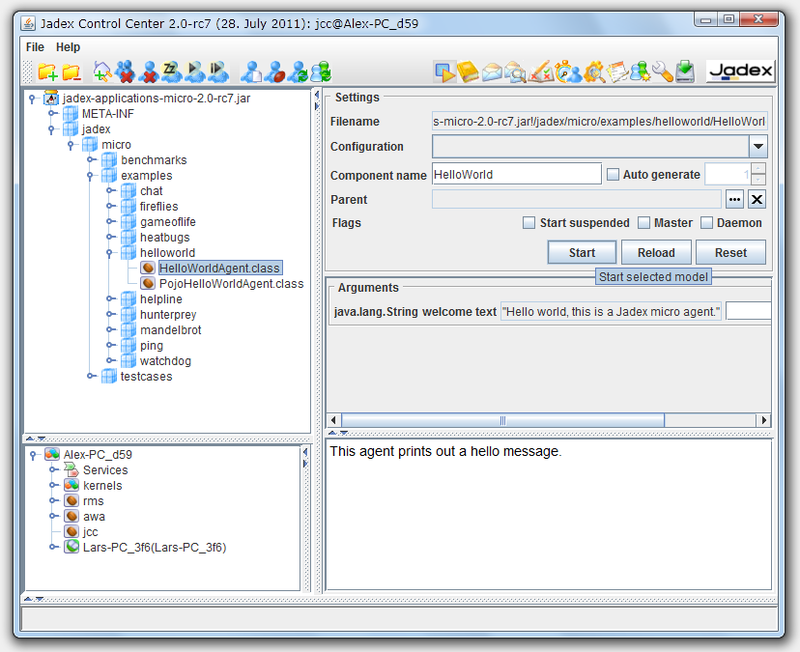 The Jadex Control Center (JCC) is a management and debugging interface for the Jadex platform and the components that run on it. The JCC includes many useful development tools. This tool guide gives an overview about the Jadex tool suite and explains how they can be used to administrate, manage, and debug your infrastructure and applications. This will launch the JCC as your application starts up the Jadex Platform. If you downloaded a Jadex distribution, you can start the JCC by executing jadex.sh (Linux/Mac OS) or jadex.bat (Windows), depending on your operating system. 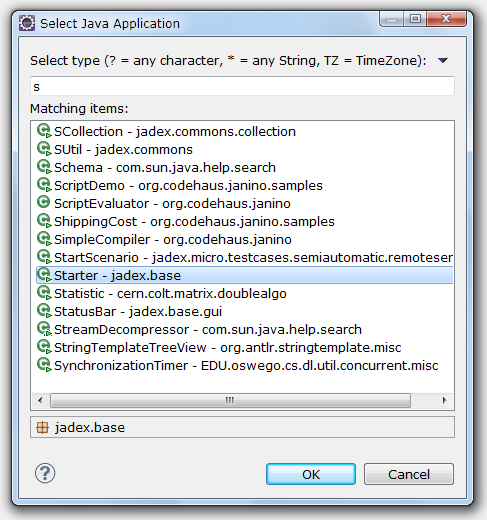 If you imported the Jadex Sources into your IDE, you can start the JCC from there: Right-click on the Jadex eclipse project and choose Run As > Java Application from the popup menu. Select Starter from the package jadex.base in the appearing dialog (just type 'Starter' to find it). Click "Run" and the Jadex Platform and JCC should start. The next time you want to start the platform, you do not have to repeat the above steps. Just choose the 'Starter' entry from the run history, which eclipse generates automatically. 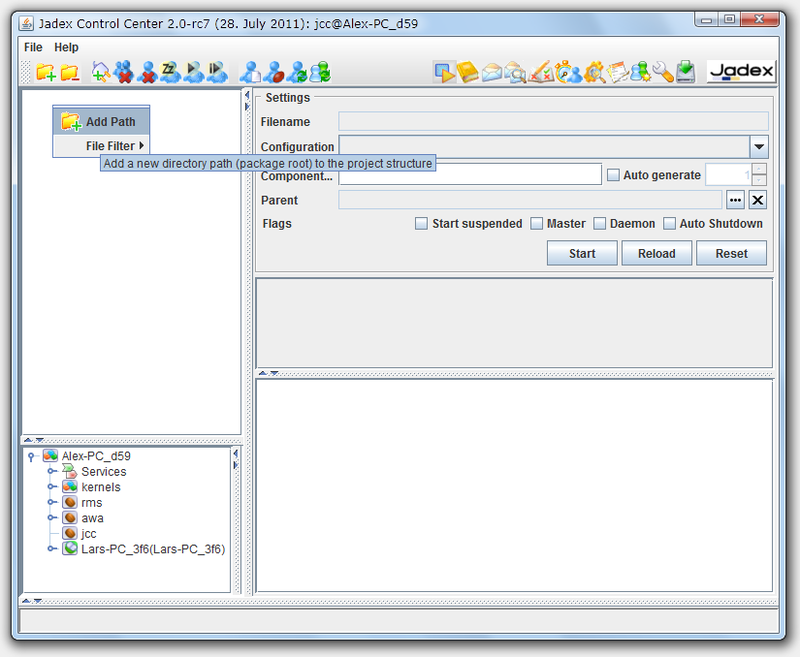 If you managed to successfully start the Jadex platform, the Jadex Control Center (JCC) window will appear (see below). To execute any applications you need to add the corresponding path to the JCC project. If you did not use the example project or want to see some other examples, you have to download the Jadex Distribution, unpack it and point the JCC to the JAR files containing the applications. Right-click in the upper left area (called the model explorer, as it is used to browse for models of e.g. components, agents or processes) and choose 'Add Path'. A file requester appears. Navigate to the directory, where you unpacked the Jadex distribution. Open the lib directory and select the file jadex-applications-micro-3.0.115.jar. Note that depending on your Jadex version the last part of the filename might differ in your setting. You can now unfold the contents of the jar file and browse to the helloworld example in the jadex/examples package. After you selected the HelloWorldAgent.class in the tree, you can start the process by clicking 'Start'. The component will be executed, thereby printing some messages to the (eclipse) console. Execute some other examples, e.g. 'heatbugs' or 'mandelbrot'. Many examples involve more than one component and are typically launched by selecting and starting the .application.xml component, which automatically starts all components of the application. You can also load the other 'jadex-applications-*-3.0.115.jar' files (e.g. BDI or BPMN) and try the examples included there. These use different component types such as BDI or BPMN. The JCC has its own way (distinct from eclipse) of loading and saving settings. The reason for this separation is to allow using Jadex without being bound to a specific IDE (like eclipse). As you probably do not want to add the jar file again, each time you start the Jadex platform, you should save the current settings. From the 'File' menu choose 'Save Settings'. The settings will be stored in two files in the current directory. The 'jcc.settings.xml' contains GUI settings like the window position. Another '*.settings.xml' file will be created named after the host name. It contains the platform settings (e.g. included jar files). The platform and JCC settings will automatically be loaded when the platform is started the next time. Chapter 11 Test Center : A JCC view for executing component unit tests.